To the south of the Kedah is the state which is known today as Perak, which is the Malay word for ‘silver’. This seems an appropriate name for a region whose place in history has long been dominated by mining. Yet it was not silver but less glamorous metals- first iron and then tin- which have been of great importance of this part of the peninsula. It is thought that it was the silvery glitter of the province’s alluvial tin deposits which gave the state its name. At first we didn’t intend to include this region in this travel blog: this southern neighbor of Kedah did not seem obviously related to the ancient kingdom. But after we considered the importance of metallurgy in the history of Kedah, we saw that the mineral riches of Perak might have played a large role in the rise of Kedah as a trading hub. As with Sriwijaya, we realized that it was useful to visit the hinterland of the trading entrepôts rather than just their main ports. The years since our journey through this part of Malaysia have only served to emphasize the importance of mining in the history of Kedah, Malaysia’s first kingdom. It appears that during 2008 excavations were being carried out at an area called Sungai Batu in the vicinity of Gunung Jerai. Whereas the temples we had seen belonged mostly to the second half of the first millenium, the site of Sungai Batu had pushed Kedah archaeology back to the second century AD, when the first references to Kedah- or rather ‘Kardoman’- had appeared in that Tamil poem. These excavations had revealed an ancient jetty complex along the river banks, which had been used in the loading and unloading of international merchandise. The digs had also unearthed evidence of iron smelting works and various tools used in the manufacture of iron tools. It seemed that mining and metallurgy had played a role in the rise of Kedah, right from the beginning of the civilization. When I arrived in Kalah, I found it to be a beautiful place surrounded by the walls of its fort, with flower gardens and water flows from springs in the ground. I saw tin mines, which incomparable to any other other in this world. Within the city I saw makers of ‘qalai’ swords, a kind of Hindu sword…….The people had a system of laws, which inlcude the use of prisons amd a system of fines as forms of punishment. They ate wheat, dates, vegetables, which are weighed before being sold and breads which were sold in piles. They did not have ‘hamam’ (Turkish baths), but bathe in fast flowing rivers. The currency was the silver dirham, which is called ‘fahri’. This passage gives us insight into many factors of life in ancient Kedah: its architecture and urban planning, its laws and customs, its economy and industries and the diet of the people. But what seemed most relevant to our onward trip into Perak was the numerous references to mining and metallurgy. We learn from Abu Dalaf that not only did Kedah have tin mines unsurpassed in the world, but also a sword-making industry renowned for its craftsmanship throughout the Indian Ocean ports and the minting of metal coins. It was to become clear that the former tin-mining cities of the northern part of Perak, Taiping and Ipoh, were the economic successors of Kedah and that tin-mining was one strand of cultural continuity between the ancient kingdom of Kedah and the British colony of Malaya, the forerunner of independent Malaysia. Our last stop on our way through Malaysia was to be ‘the capitals of tin’. We came at last to the guard post for the site. We asked if we could leave our backpacks there while we looked about. The guard was very friendly and did not even hint at a tip for his help. We were also surprised to find that there was no entrance fee for the park. In neighbouring Thailand, archaeological sites with their own museum will usually charge for entrance. On the down side, there was a blackout at the time of our visit. This meant that we were unable to see the museum. This was disappointing, but we contented ourselves with having a look around the temples. We set off to explore them, noting the large car park, the tidy fencing and the clear signposting ahead, an utter contrast with the makeshift facilities that we had encountered at Sumatra’s ancient sites. This impression was reinforced by what we found inside. The area was well-landscaped, with shade trees, shrubbery and lawns. Care was also evident in the tin-roofed shelters which protected the more vulnerable ruins. With Jerai rising steeply behind it, the site was blessed a strikingly beautiful location. But the garden-like landscaping of the site made the most of its natural advantages. Near the entrance, we spotted a number of stone yoni, indicating Hindu religious practices. The yoni symbolizes the female reproductive organs and is associated with Sakti- a Hindu goddess, the consort of Shiva. This was the first surprise of our visit. Having associated Kedah with Sriwijaya, we had expected to find a Buddhist site. Our travels in Sumatra ought to have told us that the Sriwijayan sphere was much less uniformly Buddhist than is often made out. After all, we had seen Hindu Ganesha statues, unearthed from the soil of Palembang itself. There, in the Bujang Valley, we also saw both Hindu and Buddhist shrines. Like many other regions in ancient South-East Asia, The Bujang Valley had been influenced by both religions. Our later research confirmed that over the centuries, the people of Kedah had indeed alternated between the faiths. One inscription, in the Indian Pallava script, indicates that a Buddhist ‘kingdom’ may have existed in the area as early as the fourth century. By the eighth century, Kedah had been incorporated into the Sriwijayan trading sphere, and during its long relationship with Palembang, it may be presumed to have absorbed Mahayana Buddhist influence. In 1025, Kedah was still considered part of ‘Sriwijaya’, for the Cholas attacked and defeated it as part of their war of conquest against the Sumatran-based empire. Though Indian traders had brought Hinduism to Kedah long before the Chola conquest, the religion may have gained fresh impetus after the great Hindu victory. The main temple at Merbok is Hindu, dates from this period, and is said to show traits typical of South India. Yet even apart from these big historical events, Kedah would have been subject to waves of Hindu and Buddhist influence. Situated on the Straits of Melaka, on the main trade corridor between India and China, it was visited by an exotic mix of Muslims from Arabia, Hindus from India, and Buddhists from Sri Lanka, Sumatra and China. The mixed religious heritage of ancient Kedah reflected these cultural influences. The next surprise was that not all of the temples were in situ. Some of them had been moved there from different sites in the Bujang Valley. The area was indeed rich in archaeological remains. All in all, some fifty different shrines had been uncovered in the valley. None of the uncovered temples was especially large, and they were scattered over a wide area- The Bujang Valley covered some three hundred square kilometers. We thought that perhaps the smaller temples had been moved there to protect them from vandalism. They were more easily watched over at a single site. Or perhaps the decision had been made with tourists in mind. It was certainly more convenient for visitors to visit a single site, rather than drive about the valley in search of widely scattered ruins. The different places of origin of the temples were reflected in their styles and building materials. One of the smaller temples, Candi Pendiat, was built from laterite. This stone can easily be differentiated by its red color and pitted appearance. It was one of those protected by a tin roof. The other very small temple, Candi Pengkalan Bujang, was built from brick. Despite their small size, these two temples were of strikingly different appearance. The third minor temple at the site, Candi Bendang Dalam, is also built of laterite, but the post holes around its perimeter reveal that it was originally roofed. Entirely different again was the site’s main temple, Candi Bukit Batu Pahat (loosely, The Temple on Chiselled Stone Hill.) This temple is still in situ and was easily the most satisfying of the remains in the park. Like many Hindu sanctuaries, it is surrounded by a low stone wall. This was the boundary between the secular world and the realm of the sacred. With the forested slopes of sacred Mount Jerai behind, the site would have filled the ancient devotee with a sense of reverence and wonder. In the present day, with only the foundations of the temple intact, it is still an evocative place. It is oriented in an easterly direction, which indicates that it was a Hindu temple, associated with Shiva worship. It is of a rectangular shape and built from locally quarried granite. The main beauty of this temple is the dark gray stone which was used in its construction. The section to the back is raised and a longer, lower section projects to the front. A short staircase leads between the two levels. In the large section at the front, there are a number of post holes. They are not large, so the pillars that they held must have been rather slender. On top of these would have been a roof, perhaps of thatch. It has been said that the drainage channels of this temple show South Indian influence. But, for us, the airy, open porch reminded us of the pendopo pavilions found in palaces and temples of Java, and indeed of the Royal Palace we had seen the day before in Alor Setar. Of course, being constructed of wood and thatch, there is now nothing left of the porch but those post holes. As at many archaeological sites, a sense of imagination is required to get some sense of what this temple would originally have looked like. Having already imagined a large roof above the original temple, we discussed what else had been lost with time. Thinking of the active temples we had seen in Bali, we agreed that there would have been devotes, arriving in their best clothes. There would have been offerings of incense, fruit or flowers. Filled with incense smoke, the temple would have had a dim, mysterious atmosphere- active places of worship have a certain mystique all of their own. Kedah having begun its conversion to Islam some five hundred years ago, this temple had long since ceased to attract Hindu devotees. It was now just a ruin in a pretty spot. We observed that there was now no statuary in situ. But originally the upper level would have housed the temple’s main image. Perhaps there would have been a linga, a phallic sculpture which symbolized Shiva, the God of Destruction. Or perhaps the upper level would have housed a revered image of the God. However frightful the concept seems today to the pious Muslims of Kedah, their ancestors were once worshippers of Buddha and Shiva, on the slopes of holy Mount Jerai. The next morning we rose early, eager to make an early start on our trip to the Bujang Valley. We stopped off at the Pekan Rabu Market (the Wednesday Market) for a breakfast of nasi lemak, Malaysia’s unofficial national dish. Billie is quite a keen foodie, and we were keen to have her try as much local food as possible on her trip. There are many different versions of the dish. This one included a large dollop of sambal (chilli paste), crunchy, dried anchovies and a little piece of chicken. It cost just 1.30 ringgit a serve. From there we hoped straight onto a bus to Sungai Petani, the nearest major town to the Bujang Valley. We were planning to get a taxi to the ruins from there. We headed out of town across the coastal lowlands. Kedah is known as ‘the rice bowl’ of Malaysia, and our journey took us hurrying past endless, dry rice paddies. There were only a couple of other passengers on the bus, so when the driver decided to put on a Boney M compilation, rather than the usual Malaysian pop music, we thought he might have done so for our benefit. As is often the case on South-East Asian buses, the music was played at ear-assaulting volume. We noticed that we were on a smaller road, rather than the main freeway, but as we were travelling at a decent speed, we did not let it bother us. Sean chatted with Billie about people back in Sydney, as Boney M sang Mary’s Boy Child andThe Rivers of Babylon. It was not until we came within sight of the ocean, about an hour into the trip, that we suddenly realized how far we had veered from the highway. Not long after, we came into the little market town of Yan Kecil. It was set between a large, green mountain and the sea and consisted of a few rows of old Chinese shop-houses and a small bus terminal, where we took on and put down passengers. Consulting the map in our guide book, we realized that we had taken the ‘coast’ road, which would lead us right past to the archaeological site we wanted to see. Through mere chance, we had cut an hour or more’s travelling time off the trip. Putting things together, we realized that the mountain behind us was the 1217 metre Gunung Jerai (Mount Jerai). This had been the sacred mountain of the people of ancient Kedah. Just as the Hindus of today’s Bali venerate Mount Agung as a sacred peak, the ancient Hindus of the Bujang Valley viewed Jerai as a holy place- a symbol of Mount Meru, the cosmic mountain. It had also been put to more practical uses. Visible far out to sea, it had been used for navigation by ancient mariners. Indian traders coming to take on victuals, or to barter with Kedah, would have looked for the mountain, a sign that the Malay Peninsula was ahead. It was the largest mountain in the northern part of the peninsula. On that morning, the summit was partially covered in cloud. We had read that there were the remains of a Hindu temple near the peak, a testament to the symbolic significance of the mountain in the old religions. Unfortunately, they were on the site of a military base and so were off limits to visitors. To catch a glimpse of the region’s historic architecture, we had to head to the archaeological park near the small town of Merbok. Nonetheless, Jerai provided an attractive and romantic backdrop to the final stage of our journey. The landscape at the foot of the mountain was green and lush, a sharp contrast with the dry, flat lowlands around Alor Setar. The upper slopes of Jerai were still forested. It seemed likely that clouds blowing in off the ocean would dump their rain here. It gave the area a moist, fertile look. It was certainly one of the prettiest corners of Kedah State. We got off the bus in Merbok. It was another scruffy market-town, in the mould of Yan. It had some short rows of shop-houses and a couple of small restaurants, of the plastic chair variety. It was clearly a town with a large Chinese population. There were paper lanterns hanging outside the shops and little altars within. We bought drinks at one of the shops and set off on out walk. Just outside town, we found the turn off to the archaeological site. The sign said it was it was a two and a half kilometre walk- long enough to be bothersome with our full backpacks. But though we were hardly looking forward to it, the walk proved to be a highlight of the trip. We passed by orchards, flower beds and the shrubby gardens of people living on acreage. The walk- set in the foothills of Mount Jerai- was uphill all the way. But it was a mild slope and the scenery made up for the slight discomfort. Apart from the countryside, we saw a large, village funeral in progress. The gravediggers were out in an Islamic cemetery, turning up the soil with their spades. Just a little further along, a large number of men were sitting and standing around in groups. They were wearing traditional Muslim prayer hats and sarongs. Some of them were holding strings of prayer beads. A heavy, somber atmosphere hung over the whole gathering. There was a palpable sense of shock and grief. The large number of people present and the silence which hung over the group made Billie feel that he may have been an important person locally, or that this was a tragic, unexpected death. Kedah’s history does not start with the British Empire, the city of Alor Setar or even with Sriwijaya, the Sumatran maritime empire which had claimed control of it at the end of the seventh century. Kedah may never have been one of the most powerful or impressive sites of ancient Southeast Asia, but it was a well-known trading entrepot for almost all of the last two millenniums. It was finally eclipsed to the point where few visitors to Malaysia are aware that it ever existed, and even Western archaeologists did not find its main sites in the Malayan jungle until the years just before World War Two, but in its long heyday it drew traders from as far afield as Persia and China. It was this ‘lost kingdom’ of the Malayan Peninsula which was our next destination. A Tamil poem from the second century AD mentions produce from Kadaram (the South Indian name for Kedah) being “heaped together in the broad streets” of a Tamil city. This suggests that Kedah was already a busy and productive trade centre five hundred years before the rise of Sriwijaya in the second half of the seventh century. This date establishes Kedah as one of the earliest trading centres of all Southeast Asia, competing with Oc-Eo and Angkor Borei, the main centres of Funan. There is also an archaeological record of its early importance in international commerce. Just after our visit to Kedah, Malaysian archaeologists working in The Bujang Valley uncovered two structures, one of them an iron smelting works, dating back to 300 AD. This discovery confirmed Kedah as the site of the most advanced early civilization on the Malayan Peninsula. It is thought that the iron smelted here would have been made into products that could be traded with Tamils coming across the Bay of Bengal: the Tamils and Sri Lankans were the main outside contacts with this part of Southeast Asia and some people have even imagined early Indian ‘colonization’ of Malaya during this period. The fourth and fifth century have yielded inscriptions in the Indian Pallava alphabet, including a prayer. Buddhism was already established in the area before 500 AD. It may have been commercial exchange which first brought Indian traders to Kedah, but eventually religious concepts were imported too, and Buddhism was followed by the cult of Shiva, with small Hindu temples appearing on the Kedah landscape. It seems that by the following century, China had become an increasingly important trade partner, with Kedah sending its first embassy to China in 638. The forest products of Kedah’s rich hinterland had found a lucrative new market. But by the end of the seventh century, the Sriwijayan wars of conquest against Bangka, Jambi, Lampung and West Java had completely changed the geopolitics of ancient South-East Asia. No power in the Straits of Melaka was now strong enough to stand alone against Sriwijaya, and by the end of the seventh century, Kedah had recognized Sriwijayan suzerainty, becoming part of its vast, Buddhist trading network. After this absorption, it remained a major port within the Sriwijayan ‘empire’ for many centuries. When the Cholas of India staged their devastating war of conquest against Sriwijaya in 1025, Kedah was one of the cities targeted. This shows that Kedah remained part of Sriwijaya for more than three centuries. It was to be our final destination on our trip through the Sriwijayan Empire, and to see it we had to travel south of Alor Setar to the fertile Bujang Valley, which sheltered beneath the peak of Jerai, which had once been sacred to the residents of ancient Kedah. On the fourth morning, we set off for the mainland. We took a taxi from Cenang Beach to Kuah, the main town and ferry port of Langkawi. Our taxi driver was a friendly, portly, type, with a moustache. He was delighted at being able to speak Malay to foreigners. Bahasa Melayu is very similar to Bahasa Indonesia, the Indonesian national language, and the two are mutually intelligible. We can understand spoken Bahasa Melayu, but it requires a bit of concentration, as we are not used to the accent, which is quite different from that used by Indonesians. After the initial formalities about where we were from and what we were doing there, he spoke proudly of all the development that had come to his small island, pointing out hospitals, schools, freeways and housing developments, telling us how many years ago they had been built. Like many Malaysians, he was very proud of the development which had come to the country in recent decades, pointing to the country’s vastly improved infrastructure as proof. He also asked some questions about Indonesia and was especially interested in Bali. He had the impression that Bali, being Hindu, must have been home to an Indian population. Around 8% of Malaysians are of ethnic Indian origin- a legacy of a British colonial administration which had more experience dealing with Indians than Malays- so this may well have contributed to his misunderstanding. There are Indians in some Indonesian cities, but they are a tiny minority, rarely amounting to more than a few hundred individuals. When we told him that the Balinese were Hindu but that they were ethnically Malay, he was visibly shocked. He repeated the information aloud to himself a couple of times, as if he had trouble registering it. In modern Malaysia, Malay ethnic identity is so closely bound up with the Islamic faith that it seemed to jolt his whole worldview to think that Malays could possibly have embraced that ‘Indian’ religion, Hinduism. In retrospect, his attitude reminded us of online debates we had read about whether ancient Kedah was an ‘Indian Hindu colony’. The idea that South-East Asia was once colonized by waves of Indian migrants had some academic supporters decades ago, but this view has now largely been discredited. Most Western academics now believe that Buddhism and Hinduism spread to South-East Asia by local elites adopting those aspects of the Indian religions which enhanced their standing within their own countries; the idea of divine kingship is one obvious example. Yet many Malaysian history buffs seem resistant to this idea and persist in claiming that Malays could not possibly have known how to build Hindu and Buddhist shrines. This struck as us odd. The idea that South-East Asians could not possibly have been sophisticated enough to build great civilizations is an idea which has been attacked as reflecting a patronizing, colonialist mentality- why would Malaysians want to argue this about themselves? Our conversation with the taxi driver suggested the possibility that Islam was the explanation. Malay Muslims were simply uncomfortable with the idea that Malay civilization was, for a thousand years, a Hindu-Buddhist affair. At the port we bought tickets across to Kuala Kedah on the mainland. This being Malaysia, the services were frequent, clean and reported to run on time. The service took an hour and a half, delivering on its reputation for punctuality. We passed by numerous rocky islets in the initial phase of the trip and in the later phase, the coastline of the peninsula stretched out before us. At the end, we approached the small, quiet port of Kuala Kedah, set on and named after the estuary of a minor river. There is an old fort which sits there, at the river mouth, amongst the few remaining mangrove trees. It is said to have been built to protect Kedah from its former enemy, Siam. As we pulled into port, we admired its restored, red brickwork and its mounted cannons. From the terminal, we walked a block and then sat at a local bus-stop, waiting for the service to Alor Setar, capital of Kedah State. The sight of us prompted a five-minute giggling fit in the three, teenaged girls who were waiting there too, in their ankle-length skirts and white jilbabs (Islamic headscarves). The bus came after about quarter of an hour, and we had soon completed the ten kilometre trip to Alor Setar. We got down at the central Pekan Rabu market and went on foot in search of a room. We soon found an ‘apartment’ above a strip of shops. It had a pleasant view of a narrow, little river, edged on either side with shrubby parkland. At seventy ringgit a night (around twenty dollars), it seemed a reasonable base for our day in Alor Setar. In recent years, Malaysia has emerged as a major destination for Western tourists, who are drawn there by a variety of attractions. Langkawi is now a well-established resort island, with the Sheraton and Four Seasons Hotel chains claiming pretty slices of coastline. At the opposite end of the budgetary spectrum, backpackers in search of a cheap beach holiday head to the Perhentian Islands, off the east coast of peninsular Malaysia. East Malaysia (Malaysian Borneo) is the destination of choice for naturalists. The fast-vanishing jungle of the two eastern states- Sabah and Sarawak- draws Europeans in search of orangutans, rhinoceros hornbills and pygmy elephants. Back on the mainland, the country also has a couple of well-known historical destinations: the important old sea port of Melaka and Georgetown, a former colonial outpost on the island of Penang. This is quite a varied menu for a small, tropical country, little known to tourists just twenty years ago. What Malaysia does not have is impressive temples from South-East Asia’s Hindu-Buddhist Classical Age. The elegant religious architecture which Cambodia, Thailand and Java possess in such abundance is nowhere to be found in Malaysia- a country which sits in their very midst. This fact seems even more surprising when we recall that the Malaysian Peninsula is located on the major international shipping route between India and China. With gold, porcelain, ivory, spices and jungle products being traded in these waters, why was it that the strategically located Malaysian Peninsula did not throw up any major antiquities in the whole Hindu-Buddhist Age? This question was made all the more intriguing by the knowledge that once Islam had arrived in the region, the Malayan Peninsula had suddenly thrown off its backwater status. In the fourteenth century, with the rise of the maritime sultanate of Melaka, a local state had emerged which could fully capitalize on the peninsula’s strategic location on the Straits. Why hadn’t this happened in the Hindu-Buddhist period or, if it had, why had so little trace of it remained? These were the questions I was tossing around as we headed off to Malaysia in 2009, heading for Kedah, the state of modern Malaysia which had been the most important local tributary states of Sriwijaya. For while this area boasted no large temple or other monuments, it had attracted the attention of traders in ancient times and it had been the home to a pre-Sriwijayan state called Kedah. In the Bujang Valley in the modern state of Kedah were traces of ancient settlements that showed that civilization on the Malayan Peninsula had not begun with Melaka. It was these which we intended to see- as part of a West Coast sojourn. We made it there as part of a vacation from our teaching jobs in Jakarta. Early in 2009 we left Jakarta for Kuala Lumpur on budget airline, Air Asia. In the preceding few years this cost-cutting colossus of the Southeast Asian skies had built an extensive network, especially in its home base of Malaysia. While it had certainly made the cost of flying about the region cheap compared to years gone by, it was not an unmixed blessing: frequent delays and cancellations had been the bane of recent trips abroad and we never approached an Air Asia flight without some trepidation. On this occasion the flights weren’t late but there was still a long, hot and very dull transit at Kuala Lumpur’s budget terminal. After five long hours sitting around in restaurants and lounges, with people thronging everywhere, we finally boarded our flight to Langkawi, a mere forty minutes away, up near the maritime border with Thailand. After the brief late afternoon flight, we got off at the island’s quaint, little airport and went on foot to the Langkasuka Beach Hotel, where Cameron had made a reservation. It was named after Kedah’s ancient sister state, the ruins of which had been unearthed in recent decades in Thailand’s Deep South, now afflicted by an armed rebellion. We were supposed to be meeting up there with Sean’s sister, Billie, but due to crossed wires, she had been waiting for us all day at The Sheraton Hotel. By chance, having given up on us coming to the Sheraton, she had decided to check into the Langkasuka Hotel herself and was surprised when we ran into her in the garden there, right on dusk. She had booked a room online, which was in addition to the two we had already reserved on her credit card. She said how surprised she had been when the receptionist assured her that she now had three rooms booked in her name! We spent three days on the duty-free island, which was administratively part of the modern state of Kedah. We had expected to find a somewhat crass and commercialized place but ended up remembering it fondly. Despite some unfortunate development along the coastline, there was still much to enjoy. It retained a quiet, peaceful atmosphere and a portion of its natural heritage was still intact. 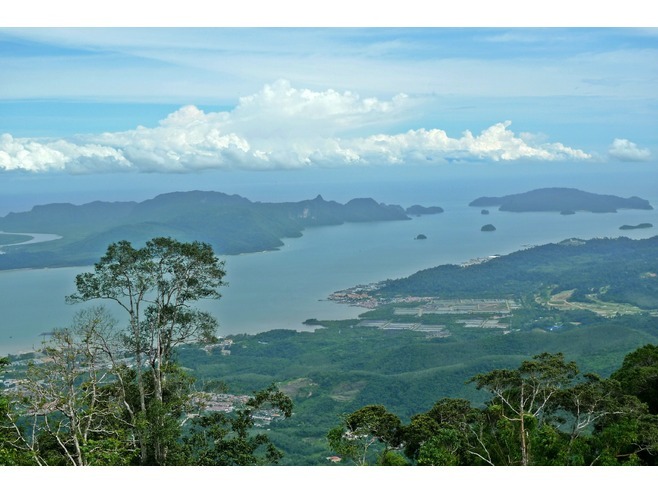 The hills boasted dipterocarp forest, filled with macaques, langgurs and hornbills, and along the North Coast, facing Thailand’s southernmost islands, rose the sheer peak of Mount Macincang. The forested slopes of this seaside mountain were the single most beautiful sight on the island. Riding a cable-car to its peak had sounded like a tourist sideshow, but we were soon reconciled to the whole affair by the sight of the jungle canopy unrolling beneath us. And even the humblest corners of the island had some charm: the humble, dusty villages, with their wooden stilt- houses and fields grazed by water buffalo, were doubtless a reminder of Langkawi before the cheap booze and tourist resorts. But this island was not really not a stop on a way to the old kingdoms. Kedah’s ancient centre had been on the mainland, in the shadow of Mount Jerai.